Welcome back to Sepia Scenes! 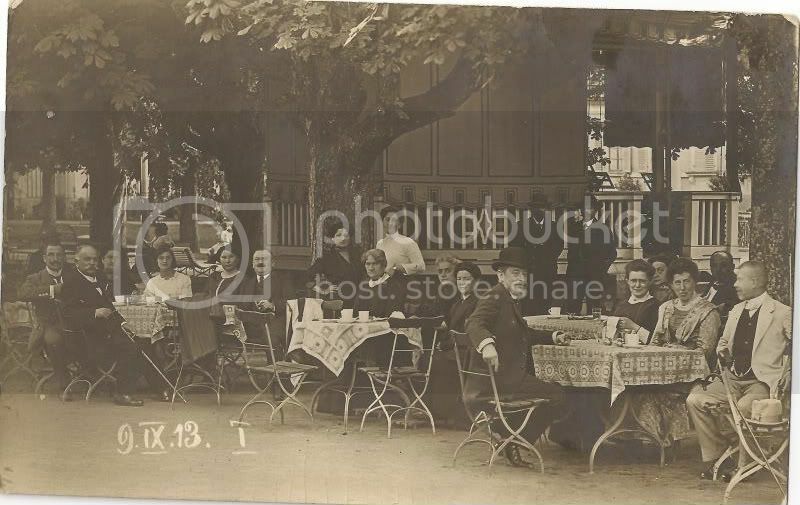 Today I have something particularly interesting: original sepia photographs from early 20th century. My dear friend, Senta, gave me the photographs below that I was able to scan (600 dpi) into my computer. They depict Bad Bruckenau in Bavaria, Germany* at the beginning of the 20th century. 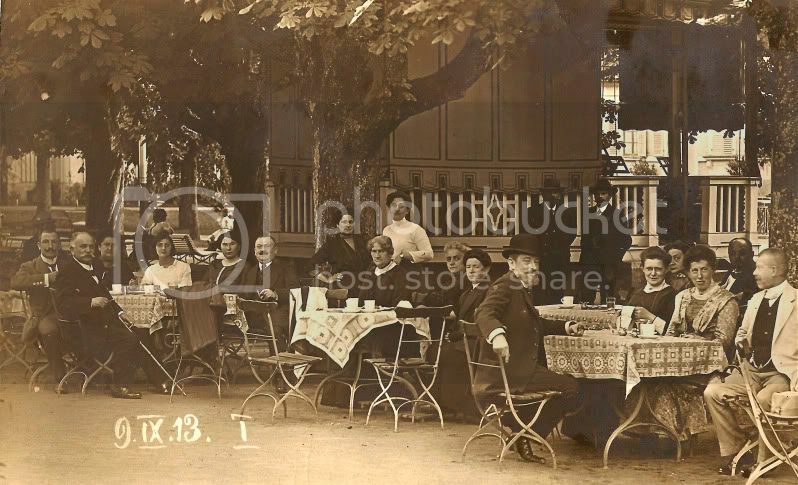 The people are enjoying their afternoon tea or maybe coffee at one of the Jewish kosher hotels in the area. Senta's grandfather is the gentleman on the left with the cane. The photos were taken by Josef Bott. The date on the front of the top two photos is 9 Sept 1913. The photo above is the original. The photo below has been enhanced just a bit by increasing the saturation. 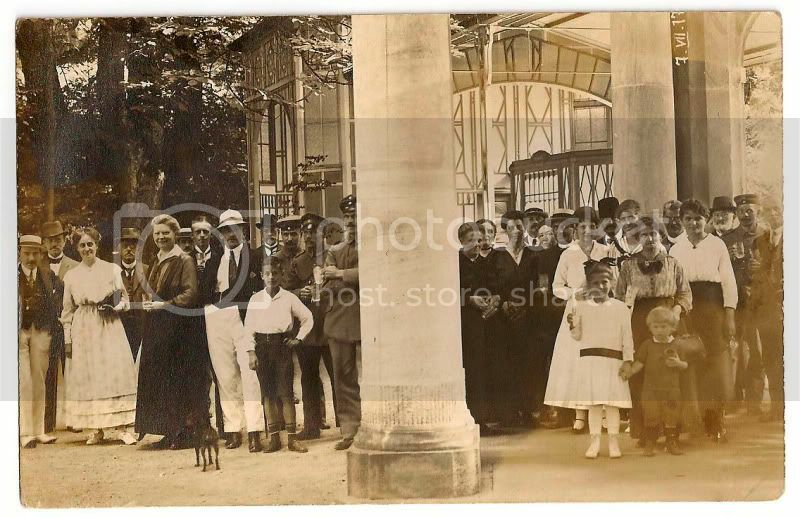 The photo below was taken at the front of the hotel (probably). The date which you can see on the upper right hand side is 7 Jul 1917. Senta's grandmother stands just to the right of the center column. I enhanced the photo by increasing the saturation. You can see it below. *Bad Brückenau is a spa town in Bad Kissingen district in northern Bavaria. It is situated in the Rhön Mountains, 30 kilometers south of Fulda. Don't forget to sign Mr. Linky and leave a comment. If you are new to Sepia Scenes, let us know so we can make a special effort to visit you. Mary these are REALLY COOL! The "real deal" as it were. Anybody curious about what a fitting subject for sepia toning would be could use these for reference. What a great gift! I love these old photo's and decided to go along with that theme also on my post. Your mimi-history of hotels and Germany was very interesting. We humans are all guilty of the same behavior everywhere, aren't we? It's only the minority group that is different. The photos are so improved when enhanced. They truly get their life back. I love these old photos! Mary, these are very cool. In both instances, enhancing the saturation of the tones made the pictures have more depth and clarity. I love visual history like this, thank you for sharing! And thanks to your friend for sharing with you! Today, at It's A Blog Eat Blog World I have a picture of some bronze wolves from the Lincoln Park Zoo that I attempted to make into an antique postcard, and over at Purrchance To Dream, Daphne is showing off her green eyes and how lovely she looks in sepia. Thanks for your fun meme, Mary - even though I am kind of blogger-burnt-out right now, I still love playing with photo enhancing software! I love these! What a treasure. The enhancement is very nice. Oh wow, that is really a good find. Nothing beats the original sepia image. Great post, teach. What a treasure these photos are, especially considering the chilling future about to unfold for all of those pictured. PS Those last pictures were taken on my birthday :). Thanks for the invitation, Mary, the stuff is really great. These are wonderful! I love old photographs. The sepia just feels right, setting the mood of that era at that moment. These vintage (notice that I didn't say 'Old') pictures are a nice glimpse of an earlier time and different culture. Nice! Mary, I love old photographs. I like to study the details and imagine the lives of those featured in the pics. These are wonderful. You haven't changed a bit since the graduation! Lovely old images! All dressed up in their finest. I love that the gentleman with the beard on the right in the image seems more than happy to have his photo taken. O what a flash back to old worlds and old lifestyles! Love this glimpse! I'm impressed that you were able to make the photos brighter. Wonderful! Absolutely amazing change - beautiful! At this week's Purrchance To Dream sepia scene, I showed a picture of Daphne before-and-after. But I had wanted to merge the two. 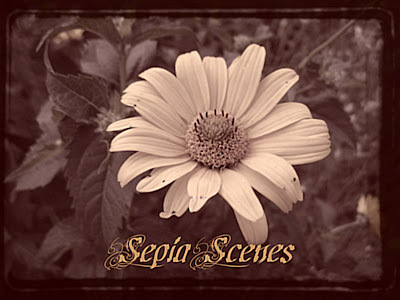 I have a second Sepia Scenes post up now at Purrchance To Dream - and the new picture is up, and I'm so happy with it! Oh Wow, these photos are way cool! Thanks for sharing. My first entry in months :( Been really busy these past few days. Have a great day everyone. My SS entry is up! Wow! Those are such fantastic pictures! It's so interesting that even though it was so long ago and they dressed so differently they all had the same thoughts and feelings that we do. Hope for our children and our families. lovely old photo's and they look great with the increased saturation. Pictures were so rare in those days that they are now treasures. I wonder how ours will be viewed 50 years from now? So much information is available and stored. I wonder if it will mean as much. Those are awesome photos! The touch ups you done are great!! I have a new blog, A View of My Life. That is where my Sepia Scenes is now located. Have a great day! !